On the Scouting trail, a Cub Scout progresses from rank to rank, learning new skills as he goes. 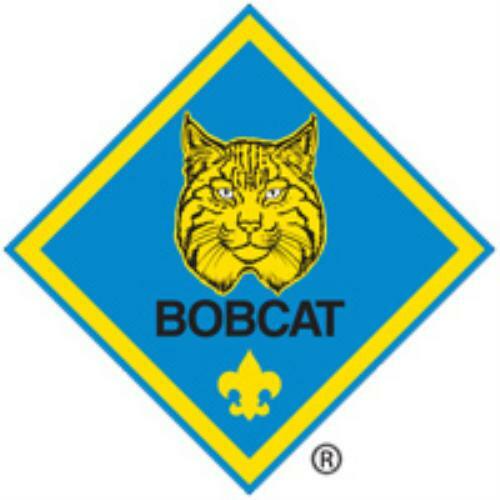 Each of the ranks and awards in Cub Scouting have their own requirements. As a Scout advances through the ranks, the adventures along the trail get more challenging to match the a boy's skills and abilities as they get older. A Tiger Cub Scout is in 1st Grade. A Tiger Cub Scout must complete 7 Tiger Adventures, earning his Adventure Belt Loops which he proudly wears on his belt. Along the way he learns about his community, how to keep healthy, takes a hike and learns some scouting skills. 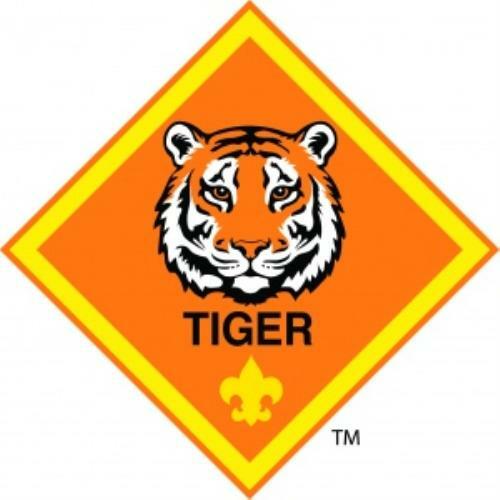 When the Tiger Scout has earned his seven Adventure Loops, he receives his Tiger Badge in a special ceremony. More Tiger Adventures Loops can be earned even after the badge is received. A Wolf Cub Scout is in 2nd Grade. A Wolf Cub Scout must complete 7 Wolf Adventures, earning his Adventure Belt Loops which he proudly wears on his belt. Along the way he learns about service in his community, performing with his den, physical fitness, more hiking and learns more advanced scouting skills. 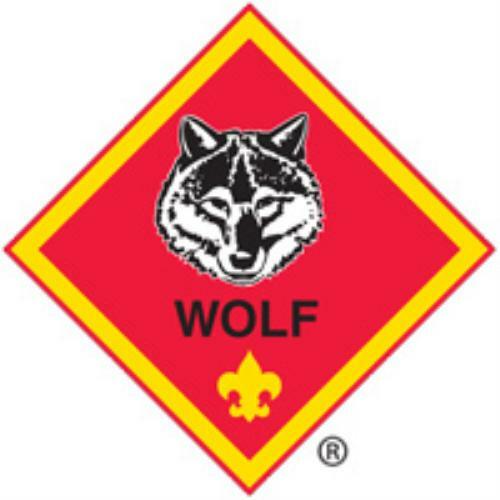 When the Wolf Scout has earned his seven Adventure Loops, he receives his Wolf Badge in a special ceremony. More Wolf Adventures Loops can be earned even after the badge is received. A Bear Cub Scout is in 3rd Grade. A Bear Cub Scout must complete 7 Bear Adventures, earning his Adventure Belt Loops which he proudly wears on his belt. Along the way he learns about the value of helping others, being loyal to your country, knife safety, and learns some outdoor scouting skills. 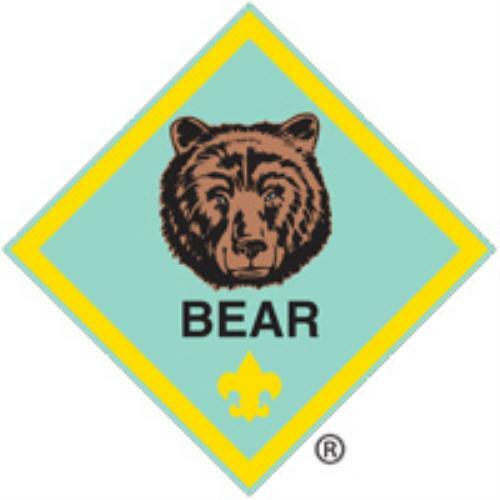 When the Bear Scout has earned his seven Adventure Loops, he receives his Bear Badge in a special ceremony. More Bear Adventures Loops can be earned even after the badge is received. A Webelos Scout is in 4th Grade. 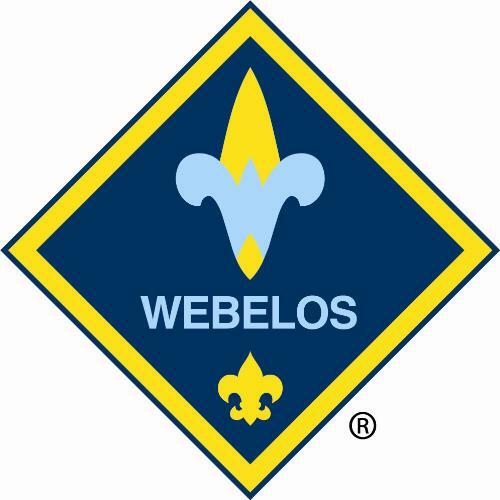 A Webelos Scout must complete 7 Webelos Adventures, earning his Adventure Pins which he wears proudly on his Weblos Colors (shoulder ribbons). Along the way he learns nutrition through menu planning, first aid, importance of physical fitness, and outdoor scouting skills. Once the Webelos Scout has earned his seven Adventure Pins, he receives his Webelos Badge in a special ceremony. More Webelos Adventure Pins may be earned even after the badge is received. An Arrow of Lighter (formerly Webelos II) is in 5th grade. An Arrow of Light Scout must complete 7 Arrow of Light Adventures, earning his Adventure Pins which he wears proudly on his Weblos Colors (shoulder ribbons). Along the way he learns citizenship, outdoor skills, and requirements for bridging into a Boy Scout Troop. Once the Arrow of Light Scout has earned his seven Adventure Pins, he receives his Arrow of Light Badge in a special ceremony. More Arrow of Light Adventure Pins may be earned even after the badge is received. The Arrow of Light Award is the only Cub Scout Badge that can be worn on the Boy Scout uniform when a Scout bridges into a Boy Scout Troop. Adult Scout Leaders who earned the Arrow of Light Award when they were in Cub Scouting may show their achievement by wearing the Arrow of Light square knot on their leader uniform.